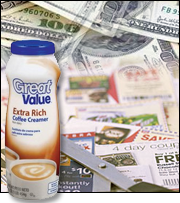 Huge Natural Sweetener News, Fast-Food Finds, Money-Saving Tips & MORE! 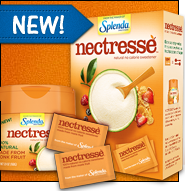 Nectresse Natural No Calorie Sweetener - Move over, stevia... There's a new calorie-free natural sweetener in town! It's from the makers of Splenda, but it does NOT contain Splenda or any other artificial sweetener. Nectresse is made with MONK FRUIT (which sounds like prayerful produce but is really just a small vine fruit). Each packet has 0 calories, 0g fat, 0mg sodium, 2g carbs, <1g sugars, and 0g protein (PointsPlus® value 0*). (Note: These carbs, from a natural sugar alcohol, have a lower caloric value than standard carbs.) We've tried it, and IT'S REALLY GOOD! On shelves and online. Click for a free sample! Yoplait Light with Fiber - Missing 50-calorie Fiber One Yogurt? Great news! The Yoplait peeps have replaced their F1 yogurt with this identical line of fiber-packed creamy goodness! In Blueberry, Key Lime Pie, Vanilla, and Strawberry, each 4-oz. container has 50 calories, 0g fat, 55mg sodium, 13g carbs, 5g fiber, 4g sugars, and 3g protein (PointsPlus® value 1*). Same yogurt; new name! Plentils Crunchy Lentil Chips - In Light Sea Salt, Garlic & Parmesan, Dill & Sour Cream, and Margherita Pizza flavors, these new lentil chips are super-delicious. Each 1-oz. serving (31 pieces) has 130 calories, 6g fat, 370 - 420mg sodium, 17 - 18g carbs, 1g fiber, 0 - 1g sugars, and 3g protein (PointsPlus® value 4*). And there are Grab & Go packs with about 100 calories each! Find 'em at Whole Foods or order online. GOOD! McDonald's "Favorites Under 400 Calories" Menu - This new menu feature -- both at drive-thrus and in stores -- takes the guesswork out of grabbing smart food on the fly. (We don't ALWAYS have time to check online!) The favorites are even broken down into categories of 400, 300, 200, and 100 calories or less. It's unlikely we'll be indulging in the 340-calorie snack-sized Oreo McFlurry, but this is a FANTASTIC way to quickly weed out the super-heavy stuff. YAY! BAD! Wendy's Son of Baconator - Promoted as a more petite version of the popular original, we are NOT fans of the so-NOT-petite stats. While it's made with smaller patties and less bacon, this thing still has alarming nutritionals: 700 calories and 43g fat (PointsPlus® value 19*)! If you need a bacon-y burger fix, we suggest our Bacon Cheeseburger Casserole or our Bacon Cheeseburger Patty! JUICY! Jamba Juice Make It Light Smoothies - Listen up, Jamba lovers! If you know you should switch to smarter smoothie options, but you can't say no to your favorite old-school flavors, you are in serious luck. Now when you order any Classic Jamba smoothie and say, "Make It Light," they'll whip up a sipper with only two-thirds of the calories, sugars, and carbs in the original. Cool!!! 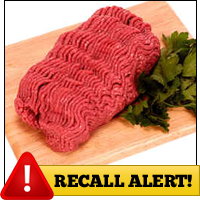 Before you make another burger, read this: Cargill has recalled nearly 30,000 pounds of ground beef due to possible salmonella contamination. Click for details, and check your packaging carefully! ***If you have doubts about the benefits of sugar substitutes, here's some food for thought: The American Heart Association and the American Diabetes Association have released a joint statement that says sugar substitutes may help with weight loss and blood sugar control. The catch? It only works if you use them as SWAPS for sugary foods and drinks. Don't just ADD them to your diet... ***Pop princess Katy Perry has teamed up with our BFFs over at Popchips as a brand ambassador and investor! She says she discovered the chips when she was "craving a midnight snack without the guilt." Sounds like our kind of girl! Should we expect rainbow-colored crisps and a costume made of Popchips? ***Agreeing on what to eat for dinner can be a pain when significant others have significantly different tastes. This is why we're sort of digging this dating site: SamePlate matches up singles based on what they like (or don't like) to eat. Plug in food preferences and dietary restrictions along with your basic info, and find yourself a mealtime date! You may not find your soul mate, but you could find your soul-food mate! ***Here's a convincing reason to get moving ASAP -- a new study found that physical inactivity could be as harmful to a person's health and lifespan as smoking. Good thing we're done with the news... Time to take a walk! Who's with us? And that's all we've got. HG out! Share the news -- it's what your pals would do for you! Click "Send to a Friend" now. Happy National Cheesecake Day, July 30th! Take a peek at this mega-decadent turtle cheesecake recipe... Then make it!